Sometimes, there’s a strange way to discover new places, and this may be one of them, for I arrived to Holmsjö because I rode in a wrong train, and without money, so I had to get down in the first station. The Holmsjö I’m going to talk about (for there’s more than one in Sweden) is a very small town in the Karlskrona Municipality, located between Karlskrona and Emmaboda (in the Kalmar County). It has an area of about 1 squared km. and population of about 500 people. The whole town is mainly distributed along one road, and the only thing that can be considered as a real monument is Sillhövda kyrka, the church. 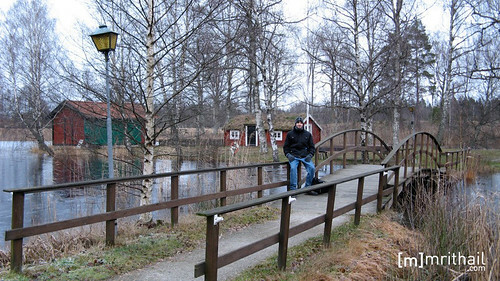 However, there are some houses that are worth seeing… very beautiful, and with really nice fences and water mills. 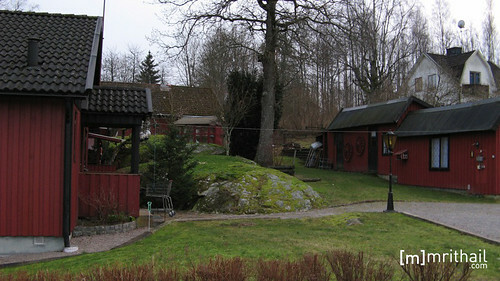 Also, in the outskirts there’s a cafe placed in a small island with a great sightseeing. When the sun and the heat comes again, I’d really like to have a coffee there. Also, the surrounding nature is fantastic, with a big lake that in some places looks as a swamp with crystal clear water, with the trees growing directly in the water and plenty of moss everywhere. The city is worth visiting if it’s on your way, but in just one hour and a half you can see it completely, for that is the time I spent there (it’s the time that took for the train to arrive to Emmaboda and go in the opposite way, to Karlskrona), and we had time to see everything very calmly, speak with some people, buy a couple of things and spare some time in the cafe’s island. And this time I’ll get some money to be able to pay the train (I took both rides for free). P.S. : It’s starting to freeze… I want to walk over the water! Btw, now in Dec, what temp are doing up there? The matter is that for going from one campus to other, I can take a train that is for free if you have your student card, so that’s why I didn’t carried any money. But from now on I’ll always carry some, it’s better, hehe. These days usually we are between 4 and 10ºC, so it’s not incredibly cold. However, one or two days per week it’s a really cold day, and those days usually we’re between -6 and 2ºC… The Holmsjö day was one of these, hehe. Also, the main problem is the wind, that makes you feel really cold. But the real cold is yet to come… it’s in January and February.